Summary: Discussing his recent dinner with Rev. Al Sharpton at the Harlem restaurant Sylvia's, Bill O'Reilly reported that he "couldn't get over the fact that there was no difference between Sylvia's restaurant and any other restaurant in New York City. I mean, it was exactly the same, even though it's run by blacks, primarily black patronship." 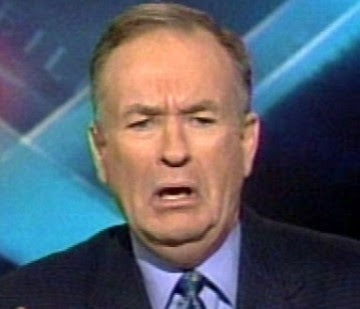 O'Reilly added: "There wasn't one person in Sylvia's who was screaming, 'M-Fer, I want more iced tea.' "
* On the June 7 edition of The O'Reilly Factor, O'Reilly said of Edwin Roy Hall -- the man charged with murdering 18-year-old Kelsey Smith after abducting her from the parking lot of a Target store in Overland Park, Kansas: "[T]his guy who is charged has a child and a wife. You know, he's like white-bread guy. And we're all going, 'What is that?' "
* On the August 16, 2006, edition of The O'Reilly Factor, O'Reilly argued extensively for "profiling of Muslims" at airports, arguing that detaining all "Muslims between the ages of 16 and 45" for questioning "isn't racial profiling," but "criminal profiling." * During the April 12, 2006, broadcast of The Radio Factor, O'Reilly claimed that on the April 11 edition of The O'Reilly Factor, guest Charles Barron, a New York City councilman, had revealed the "hidden agenda" behind the current immigration debate, which, O'Reilly said, was "to wipe out 'white privilege' and to have the browning of America." O'Reilly suggested that this "hidden agenda" included plans to let "people who live in the Caribbean, people who live in Africa and Asia ... walk in and become citizens immediately." * In a February 27, 2006, conversation with a caller about the disproportionately few jobs and contracts that have gone to locals in the rebuilding of New Orleans, O'Reilly said: "[T]he homies, you know ... I mean, they're just not going to get the job." * On the September 13, 2005, broadcast of The Radio Factor, O'Reilly claimed that "many of the poor in New Orleans" did not evacuate the city before Hurricane Katrina because "[t]hey were drug-addicted" and "weren't going to get turned off from their source." O'Reilly added, "They were thugs."